At the Donkey Sanctuary of Canada, everybody knows who wears the pants. 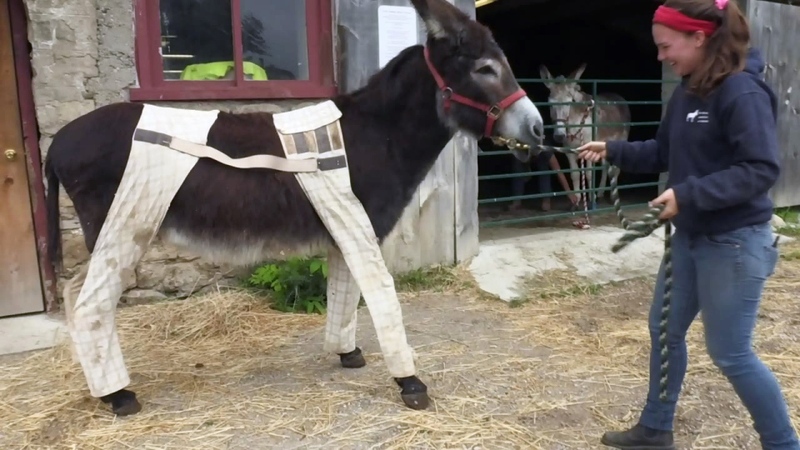 Big Ben, one of the 86 donkeys housed at the Puslinch facility, has been wearing a specially made pair of trousers since the spring. Ben has always had problems keeping flies away. For one reason or another, the bugs seem drawn to him. One day, Elizabeth Brezina, who works at the sanctuary, jokingly suggested that they should find a way to cover Ben’s legs in pants to dissuade the flies. Sanctuary volunteer Sheila Zanyk took the idea seriously. She scoured the internet to see if anything similar had been done elsewhere, and found one design that she considered a possibility. After making some modifications – the design called for very straight legs, while Zanyk figured angled back legs would be more comfortable for Ben – and taking Ben’s measurements, Zanyk got to work putting her concept into action. “It took a few tries, but it’s working well now,” she says. Ben has since been given a second pair of pants, for when he gets tired of the plaid originals. Brezina describes them as “funky” pants with a mosaic design. He’ll wear one pair or the other every day until winter, when the flies disappear for the season. Zanyk has also created pants for a second donkey at the sanctuary, Gilbert, and a third, Beau. She says Beau’s first fitting didn’t go well because the animal was “alarmed by the sound of the Velcro” used to fasten the garment. Brezina says all three donkeys have enjoyed showing off their new clothes around the sanctuary, potentially making some of the other animals jealous. “I think if it was up to them, they’d all have pants – but Sheila would never be leaving her sewing machine,” she says. A donkey named Big Ben wears pants at the Donkey Sanctuary of Canada on Wednesday, June 20, 2018.